Update! For El Capitan and users of newer version of OS X, you may run into issues installing Torch or Lua packages. A fix is included now. Update number two! Zach in the comments offers a really helpful fix if you’re on Sierra. Update three! A lot has changed since 2016, so I’ll be posting a new version of this tutorial soon. In the meantime, please see the comments for common sticking points and troubleshooting. There have been many recent examples of neural networks making interesting content after the algorithm has been fed input data and “learned” about it. Many of these, Google’s Deep Dream being the most well-covered, use and generate images, but what about text? This tutorial will show you how to install Torch-rnn, a set of recurrent neural network tools for character-based (ie: single letter) learning and output – it’s written by Justin Johnson, who deserves a huge “thanks!” for this tool. The details about how all this works are complex and quite technical, but in short we train our neural network character-by-character, instead of with words like a Markov chain might. It learns what letters are most likely to come after others, and the text is generated the same way. One might think this would output random character soup, but the results are startlingly coherent, even more so than more traditional Markov output. Torch-rnn is built on Torch, a set of scientific computing tools for the programming language Lua, which lets us take advantage of the GPU, using CUDA or OpenCL to accelerate the training process. Training can take a very long time, especially with large data sets, so the GPU acceleration is a big plus. Installing Torch will also install Lua and luarocks (the Lua package manager) so no need to do that separately. We’ll be doing everything in Terminal – if you’ve never used the command-line, it would be good to learn a bit more about how that works before attempting this install. If you’re running a newer OS such as El Capitan, you may run into problems installing Torch, or installing packages afterwards. If that’s the case, you can follow these instructions. This downloads the Torch repository and installs it with Lua and some core packages that are required. This may take a few minutes. Which should give you the Torch prompt. Use Control-c twice to exit, or type os.exit(). * You can install Torch anywhere you like, but you’ll have to update all the paths in this tutorial to your install location. Note: this step is only possible if your computer has an NVIDIA graphics card! We can leverage the GPU of our computer to make the training process much faster. This step is optional, but suggested. Download the CUDA tools with the network install – this is way faster, since it’s a 300kb download instead of 1GB: https://developer.nvidia.com/cuda-downloads. Set Computer Sleep to “Never”. There are further tests in the NVIDIA docs, if you want to try them, but they’re not necessary for our purposes. If you want to go deeper into this process, you can follow these instructions from NVIDIA. Torch-rnn comes with a preprocessor script, written in Python, that prepares our text for training. It will save our sample into an h5 and json file, but requires the HDF5 library to be installed. If you haven’t used git or Github before, as Luke points out in the comments, you might get an SSH key error. You can get a key, or just download the repository manually from here. If it imports without error, you’re good! Now that we’ve prepared our computer with all the required libraries, it’s time to finally install Torch-rnn! Download the ZIP file from the project’s GitHub repository. Unzip it and rename to torch-rnn. We’re ready to prepare some data! 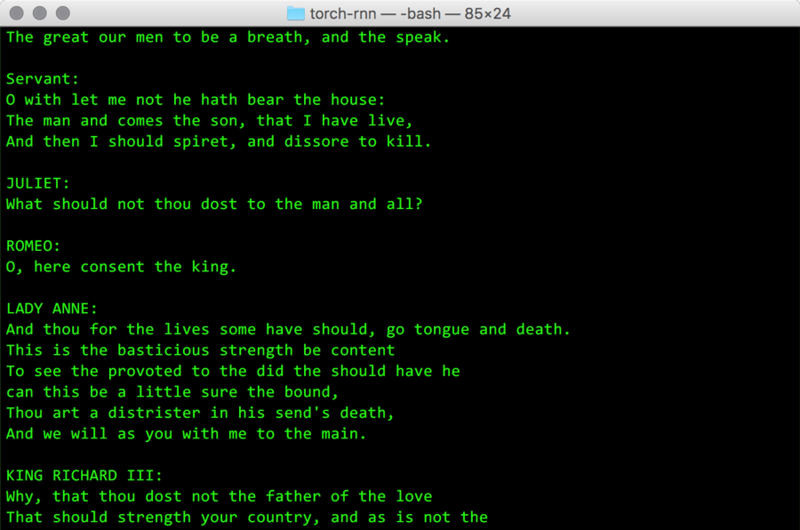 Torch-rnn comes with a sample input file (all the writings of Shakespeare) that you can use to test everything. Of course, you can also use your own data; just combine everything into a single text file. This will save two files to the data directory (though you can save them anywhere): an h5 and json file that we’ll use to train our system. The train.lua script uses CUDA by default, so if you don’t have that installed or available, you’ll need to disable it and run CPU-only using the flag -gpu -1. Lots more training and output options are available here. Setting -batch_size somewhere between 1-10 should give better results with the output. The -checkpoint argument is to a t7 checkpoint file created during training. You should use the one with the largest number, since that will be the latest one created. Note: running training on another data set will overwrite this file! The -length argument is the number of characters to output. This command also runs with CUDA by default, and can be disabled the same way as the training command. Lots of other options here. Changing the temperature flag will make the most difference in your network’s output. It changes the novelty and noise is the system, creating dramatically different output. The -temperature argument expects a number between 0 and 1. In other words, everything is a trade-off and experimentation is likely called for with all the settings. That’s it! If you make something cool with this tutorial, please tweet it to me @jeffthompson_. These directions were really handy, thanks! I just noticed a few things that have changed. First, I found that I had to install the HDF5 package before I installed the Python library. But it turned out that I was still able to import the library without issues. Then you should be able to run the preprocess and train steps. Thanks for the suggestions! I’ve updated the tutorial to install HDF5 first and to warn about the warnings. For downloading Torch-rnn, you can either download the ZIP or clone it. I think git cloning is more confusing if you’ve never done it before, so I stick with a more traditional click-and-download here. I just asked you how to import tweet as start text for torch-rnn in twitter. I just found a project “neuralsnap” by Ross Goodwin in github, he used python wrapper to alternate the start text for char-rnn. I have no experience with Python before, now I am trying to find out if this would work. What do you think? Not sure where you’re running into trouble. You can train char-rnn on any text, or use an initial text (a tweet, for example) to “seed” the output. If you want to get a tweet automatically from Twitter, that will take some programming work – I use https://github.com/bear/python-twitter for my bots, which might be a good place to start. Sorry if it is too stupid, it’s my first time working with terminal and Python. I already trained torch-rnn, now I am trying to call it in python script so that it can get the twitter as input and triggered by Arduino signal, using Python is the best solution based on my research. I use subprocess.Popen to call all commands, it seems like the model (.t7) can not be processed. Not stupid at all :) The pre-processor for torch-rnn is a Python script, but the actual output script is in the Torch langauge. If you’re getting errors getting output, I’d post a question to the torch-rnn Github page. anyway thanks a lot for your patience!! these are really great instructions. just two things tripped me up. 1) you need to have an SSH key setup for github. otherwise when you try to clone the hd5 library, it has a security error. this sounds daunting but git provide really good code you can just copy and paste into terminal to set one up in a couple minutes and associate it with your github profile. 2) if you don’t have a GPU, then the training on step 7 will fail and throw you some weird error messages. you have to include the flag ‘gpu -1’ at the end of the training statement to just train in ‘CPU mode’. Glad it helped! The Github SSH key thing is good to point out for users that haven’t used it before – I’ve updated the tutorial. The non-CUDA instructions are in the tutorial, but easy to miss with so many details! First command in STEP 7, seems you’ve got some _ in the filenames that should be -. Dustin – the files are named in step 6 (they can be whatever you want). Mine use underscores, so if you just copy/paste it should work no problem. which named the output files like the input. Feel free to delete these noise comments! Error: Build error: Failed building. Thank you for such a detailed tutorial . luarocks make hdf5-0-0.rockspec —> throws an error cannot satisfy dependency : Torch >= 7 , torch has been installed and i did verify from my terminal . I appreciate your help . Greg – Looks like you didn’t install HDF5 first (see the previous part of that step) or the install of HDF5 didn’t work. Archy – If you type th into the Terminal, what output do you get? If should open an interactive prompt and say “Torch7” somewhere. If you don’t get the prompt, it means Torch wasn’t installed properly, or you didn’t add it to your .bash_profile (either way, check the step again). If you did get the prompt but it says “Torch6” or something, it means you have the wrong version of Torch installed. Only other thing I can think of: is everything stored in the right places (ie following the locations in the tutorial)? Otherwise, sorry! You’ll have to post an issue on the HDF5 repo. First, bash install-deps for torch didn’t work for me because SourceForge was having some kind of issue (SHA256 mismatch) that prevented me from downloading gnuplot-5.3.0. I had to look around for a mirror of the .tar.gz and put it in Homebrew’s Cellar before installing. This might be a transient issue, but I also had some minor hiccups when brew was dealing with packages I had already installed. Second, even after installing HDF5 with brew (brew install hdf5 after tapping the science keg) when I tried to run luarocks make hdf5-... I was getting an error saying that the HDF5 library couldn’t be found. I think I got rid of it by running brew install hdf5 --with-mpi but that might have been a coincidence. In any case, I downloaded the HDF5 source and built it and that solved my problems. Also, I tried using the -gpu_backend opencl flag (my MacBook Pro 13″ has Intel Iris–no CUDA!) after installing the torch-cl distribution from https://github.com/hughperkins/distro-cl but it seemed to run slower than just using the CPU. I guess I could have installed an OpenCL luarock but hughperkins’ site told me not to! Thanks for the heads up, Joshua. The gnuplot site appears to be down too, but it’s available via Homebrew (brew install gnuplot). Re HDF5 thanks for the tip! A few others have had issue, so I’ll add the --with-mpi suggestion. Lastly, I found similar results with CPU and GPU, though on very large datasets I think it can start to pay off. I’ve tried looking it up – so far I think it might have something to do with Cuda, but I’m not sure. How do you think I should go about fixing this? Where is the Train-rnn folder? @Sayan: it’s wherever you made it! In step #5 of the tutorial, you download torch-rnn, rename the folder, and move it to your Torch folder. That’s where you do all the training and output from. @Sayan: it’s possible this is related to your other question? I’m not sure, but it sounds like it can’t find your HDF5 install. Hi, first of all thank you for your guide! I have tried to uninstall and reinstall hdf5 but the same error persists..
@Sayan have you found a way to make the system see hdf5 ? @Adam: hmm, did you try it with a different text file? I wonder if there’s an issue with your input? It it still doesn’t work, I think this is a Torch-rnn issue and you should post it on the Github page. @Xavier: if you don’t have CUDA support, you need to add the flag -gpu -1. If that doesn’t do the trick, I think this might be an issue for the Torch-rnn Github repo – I really don’t know much about Torch or Lua themselves. @sayan there was someone with the same issue here, and they fixed it: https://github.com/deepmind/torch-hdf5/issues/58 . Unfortunately I am running into the same error: (dyld: Symbol not found: _H5_init_library) and reinstalling everything from scratch did not help me. Thanks Charles for the fix! @Marium: this has already been answered in the comments. Thanks for this! However I’m getting the hdf5 error running on Mac OSX. @charles: Can you check the syntax carefully? It looks like a couple of lines are running together and for some of us it isn’t clear where the break should be. Also, maybe we need to adjust for the current version? Sorry, but a bit more handholding…..
@Jeff: I followed all the steps and read all the solutions in the comments. I have not been able to get past the error in Step 7 that others are also having. Note, I’m not using the CUDA step, so perhaps something there is required and some of us are not running that step? I’d love to get this running. Please let me know if I can help troubleshoot (though I’m not an expert, I can follow directions). Thanks. @Ben and Brazuca: I cleaned up @Charles’ code a little to make it easier to read. Does that help? Otherwise, I’d suggest posting an issue with the Torch-rnn repo. Since I don’t really know what’s happening under the hood of the software, not sure how much help I can be! $ make check # run test suite. $ make check-install # verify installation. Is there something I need installed for this part to work? I’ve used command line before but all of this is outside my current knowledge / experience enough that I had to install XCode for the first time to get this far. “Far”. @Evan: not so bad! You installed XCode, but did you install the command line tools for it? I’m guessing that might be it. If you did, you can separately install cmake like this: https://cmake.org/install. @Jeff: Installing cmake separately worked, thanks! I got through the rest of the tutorial with only the hd5.h error some others have been having, and managed to train and output with the Shakespeare text, but when I trained Torch-rnn on a different input file then tried to output at various temperatures I got the same few words looping over and over again. I feel like this is something to do with the t7 files, do I have to clear the cv folder every time I want to train something new? If it’s repeating and not giving good output, your training texts are probably far too short. If it’s giving you Shakespeare when you trained it on something else, it’s probably that the Shakespeare training got further, so those T7 didn’t get overwritten, and you’re using those by accident. Clearing the folder before training on a new set is an easy way to avoid that problem.